If you are looking to relocate in the Kansas City metro area, you should consider buying a home in the remarkable suburb of Lee’s Summit, Missouri. Lee’s Summit has been named one of the “Top 10 Happiest Places” in Missouri, and one look at all this amazing city has to offer will make you understand why. Composed of 65.87 square miles in Cass and Jackson counties, Lee’s Summit is home to around 91,800 residents southeast of Kansas City. Convenient access to U.S. 50, I-470, M-291 and M-150 make all the fabulous dining, shopping, entertainment and recreation of K.C. just minutes away from Lee’s Summit residents. Also nearby and easily accessed are great K.C. attractions like the Kansas Speedway, Sporting K.C., Kauffman and Arrowhead stadiums. Lee’s Summit is an excellent place to raise a family because students in the city are served by numerous top-notch school districts. Families also enjoy the plethora of cultural and historical points of interest nearby, not to mention the Kansas City Zoo, Legoland Discovery Center and the Worlds of Fun and Oceans of Fun amusement parks. With the abundance of truly remarkable amenities, it is now wonder Lee’s Summit is such a popular destination among homebuyers. Homes for sale in Lee’s Summit vary in price depending upon the home’s size, age, location, architectural style and special features. Homes come in golf, gated, lakefront and master-planned communities and include condos, townhomes and single family homes. 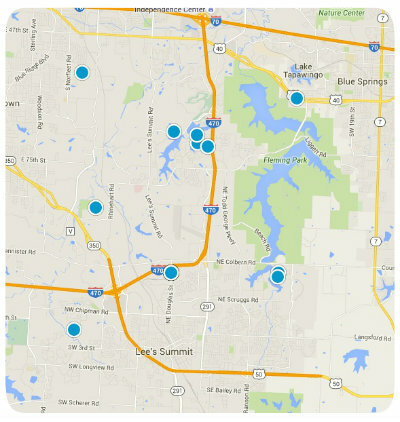 One of Lee’s Summit’s most prestigious communities is that of Winterset. The 5 neighborhoods of Winterset are all equally beautiful and luxurious. In addition to the natural beauty of this wooded community, residents of Winterset also enjoy 3 neighborhood pools, a community center, tennis courts, fishing lakes, over 5 miles of scenic walking trails, multiple parks and a golf chipping area, among many other great features. Homes for sale in Winterset vary depending upon which neighborhood you choose. For example, Winterset Valley is the newest development within Winterset Park. Winterset Valley is a master-planned community with new homes ranging from $320,000 to $1.5 million. There are multiple floor plans from which to choose, and each is unique and beautiful. The Westridge is a two-story home with 4 bedroom and 3 bathrooms. The Ralston is a one-story with 4 bedrooms and 3.5 bathrooms. The Carolina is a one and a half-story home with 4 bedrooms, 3.5 bathrooms and 2,907 square feet of living space. The Laurel III is also a one and half-story home, but with 5 bedrooms, 4.5 bathrooms and 3,120 square feet. There are many other designs to choose from, including homes with 5 bedrooms, 6 bathrooms and up to 4,974 square feet of living space. If you would like more information regarding homes for sale in one of the 5 neighborhoods of Winterset, or if you have questions regarding other real estate options in Lee’s Summit, Missouri, please do not hesitate to contact us today. Listing courtesy of Jonathan Goforth of Keller Williams Platinum Prtnr. Listing courtesy of Yori Fluhrer of ReeceNichols East. Listing courtesy of Melinda Selvey of RE/MAX State Line.